One of the more utilitarian—but not often seen (or heard)—complications is the mechanical alarm. For many of us the morning routine involves winding, swirling or setting a mechanical watch, but often starts with the shrill sound of a digital alarm clock. The vibrations of a mechanical alarm also offer a real connection between the wearer and the watch, and those interactions are often mentioned as one of the appeals of mechanical timepieces. So, what is the history of the alarm complication, and why isn’t it more prevalent in contemporary mechanical watches? In the second installment of Complications, we’ll explore the mechanical alarm. The first wristwatch with a mechanical alarm was created in the 1910s by Eterna, based on a pocket watch featuring an alarm set by a rotating bezel. The problems involved in making this work in a much smaller wristwatch included erratic timekeeping caused by the alarm’s vibrations, the resultant chime or vibration being entirely too quiet, and even the alarm taking too much power away from the main mechanism. The alarm watch never really gained great popularity until Vulcain developed their famed Cricket in the 1940s, and other manufacturers soon followed suit. The Cricket started out life containing a hand-wind caliber (120) with two barrels—one for the mainspring powering the movement and another with a mainspring to drive the alarm. A single winding stem charged both barrels, clockwise for one and anti-clockwise for the other. Similarly, at the next crown position the time was set by turning in one direction and the alarm position set by turning the opposite way. The Vulcain also featured a pusher to stop the alarm rather than just letting it run until all power was released. The alarm itself was set within a 12-hour period, and attached to a cam under the dial. When triggered, the cam activates a lever which then releases the energy from the alarm’s mainspring to power a hammer. The hammer oscillates against a “gong” up to 1,300 times in 25 seconds. The resulting chirping noise gives the Cricket its name. To aid audibility, the main exterior case back featured four sound holes to allow the sound to escape. Other problems were overcome by reinforcing the case screws with washers to stop them from loosening and the regulator being held in place by a lock to combat the effects of the alarm vibrations. Similar designs and obstacles have been common throughout the life of the mechanical alarm. Watch the video below to see the whole thing in action. As well as being the watch that brought the mechanical alarm, the Vulcain Cricket is also well known as the Presidents’ watch. The tradition started when Harry S. Truman was given the watch by the White House Press Photographer’s Association. Dwight D. Eisenhower wore a Cricket before becoming president, and Vulcain have gifted them to many presidents right up to the present day. Lyndon B. Johnson was the biggest fan of the Cricket having purchased 200 of them to give away as gifts while in office. With recent news of Vulcain’s change of ownership it remains to be seen what the future may hold for the Cricket. Swiss print ad from 1956. Pictured is Eisenhower wearing his Vulcain Cricket. At the start of the 1950s, Jaeger-LeCoultre introduced the first alarm watch with automatic winding. The Memovox line had started out as a hand-winding watch in direct competition with Vulcain, but the 815 and 825 movements (the 825 has a date whereas the 815 does not) were both forward leaps. These used a bumper rotor around the perimeter of the movement to wind the mainspring of the main movement, with the alarm mainspring still wound by hand via the crown. Among others, the 815 movement was used in the 200-meter water resistant Deep Sea dive watch. Despite the additional engineering requirements in order to reach 200 meters of water resistance, the Memovox alarm is regarded as one of the loudest on the market and can be used on the wrist while diving. The Memovox later received a fully automatic movement with a bidirectional rotor charging both barrels without the need for hand winding. Omega, on the other hand, opted for a solution where only one barrel was necessary in their Lemania-powered Memomatic model. Only having a single barrel obviously saves space inside the watch and avoids the risk of the mainspring being completely exhausted by a single burst of the alarm. Upon being triggered it only sends power to the hammer for a single rotation of the barrel. The Memomatic also holds the honor of being the first alarm wristwatch that could be set more accurately than to just the nearest quarter of an hour. 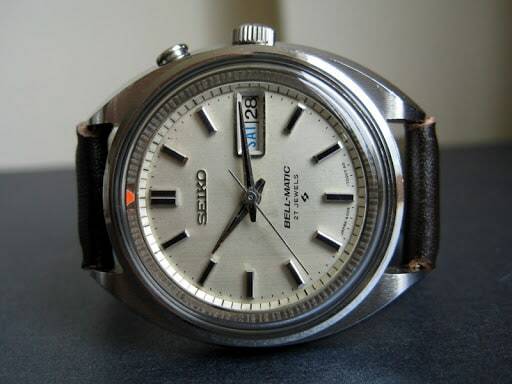 Throughout their history Seiko has brought mechanical watches to the masses and their foray into the mechanical alarm world started and ended with the Bell-Matic line produced between 1966 and 1978. At the time, the Bell-Matic was the first mechanical alarm to feature a central rotor, though the alarm is still wound by hand. Good examples using the 4005a (date only) and 4006a (day-date) movements can easily be found for around $200. Unfortunately, the arrival of quartz and digital watches had a devastating effect on the mechanical alarm watch in particular. Unlike the mechanical watch industry in general, and some of the other more fashionable complications today, the alarm never really recovered. In addition to JLC and Vulcain, Tudor does still offer an updated version of the Advisor, now presented as the Heritage Advisor using an ETA 2892 as a base movement. Overall, the pickings are slim for modern mechanical alarms at the more affordable end of the market. Thankfully, due to the widespread usage of A. Schild, Lemania and Poljot alarm movements during the 1950s and 1960s there are plenty of examples out there for the budget-conscious buyer.